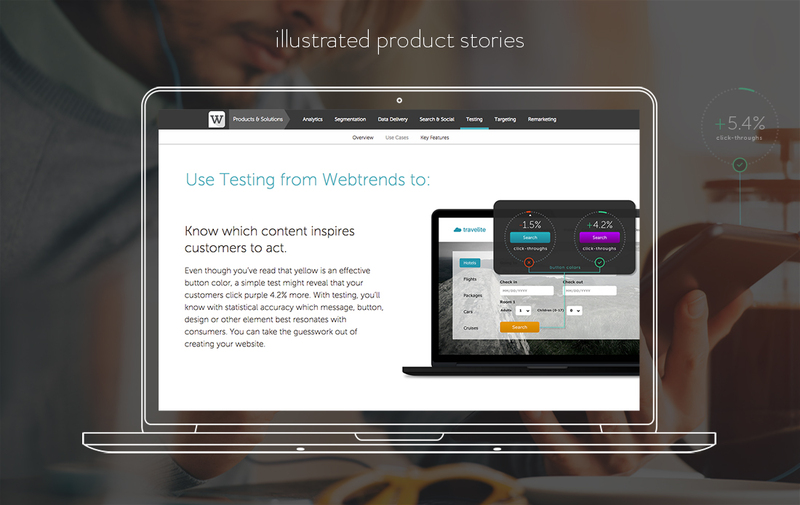 Redesign webtrends.com to be a better experience on all devices with a simplified story and journey that will generate more leads. Make it much easier to understand the distinction between product offerings and their unique value propositions for both marketing and IT personas. Simplify the navigation, as over time it had become bloated, confusing and cluttered with links. 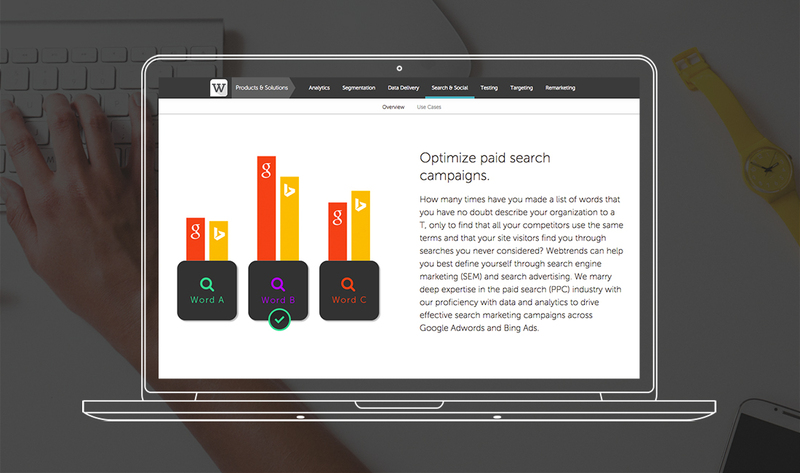 Implement website personalization to demonstrate the power of Webtrends real-time personalization products. Inject more of Webtrends “data-centric” brand personality into the site. 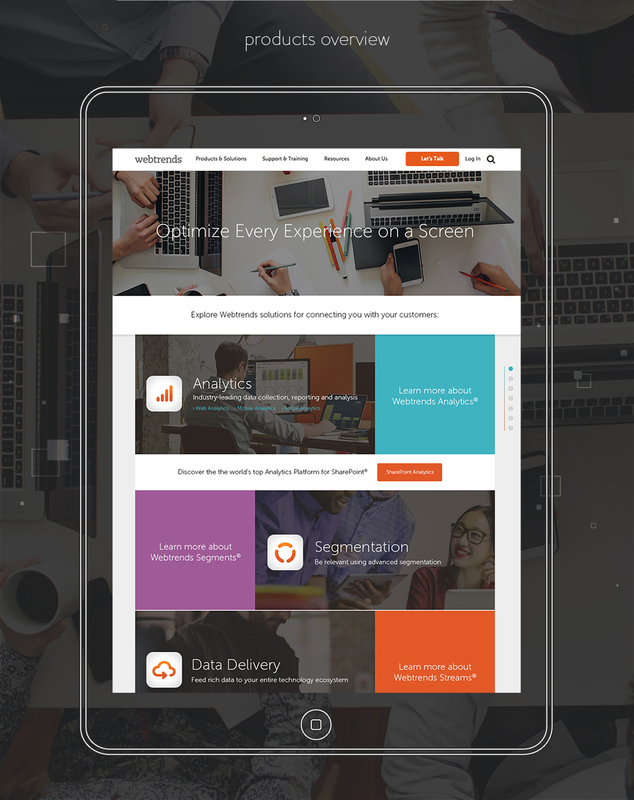 Create a centralized, easily accessible hub for product logins. 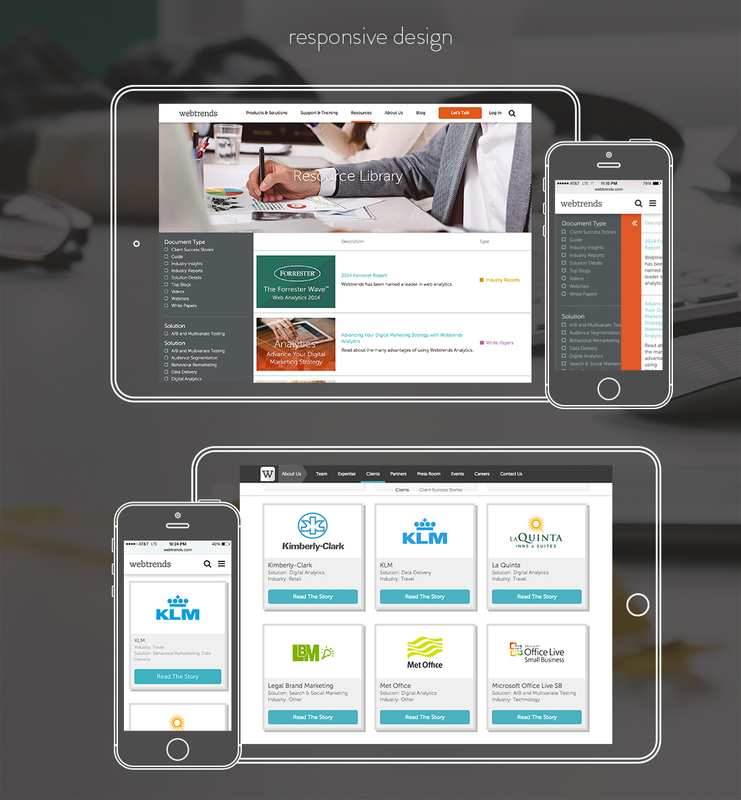 I designed the experience and interface of every page of the site and led the development of the entire project. We started by understanding our personas and creating clear, measurable objectives for the site. We looked at analytics data to find opportunities, talked to clients and prospects to understand how to provide value to our users, and mapped out the site structure to establish the information architecture before starting design. We wireframed core page types and identified the content requirements of these pages. I designed a far simpler navigation with a login shelf that consolidated all product logins. I took a mobile-first approach and made the entire site responsive. I used branded icons and solution pages to distinguish product offerings. I created video and illustrated demos of product features and use cases to make the capabilities and product distinctions clear and highly visual. I integrated visualizations of “data” into the elements of the site to represent the brand’s personality. We used A/B testing to select the colors and layouts that drove the highest conversion rates for lead generation forms and buttons and used Webtrends products to personalize headlines on pages based on user location and profile data. Increased form submissions 85% (6 months after launch YoY). Increased page views 69% (6 months after launch YoY). Increased website visits 37% (6 months after launch YoY). Increased average time on site 19% (6 months after launch YoY). Reduced bounce rate by 14% (6 months after launch YoY).